Call of Duty: Black Ops 4 zombies is out, bringing three maps at launch, plenty of new weapons and mechanics, plus heaps of easter eggs. Black Ops 4 Zombies is Treyarch’s fifth time in charge of the mode and marks ten years of the popular Zombies mode. If you’re looking forward to mowing down endless waves of undead with Pack-a-Punched MGs then here is everything you need to know about Black Ops 4 Zombies. From the return of familiar faces, such as Richtofen and “Tank” Dempsey, to the new and returning gameplay features that will make up Black Ops 4 zombies. With Black Ops 3 taking the zombies mode to absurd new places, such as fighting dragons in the ruins of Stalingrad, it looks like Treyarch are kicking off with some equally absurd scenarios for this year’s undead horde mode. So, we’re going to keep things simple and run through everything we know about Call of Duty: Black Ops 4 zombies, from Custom Mutations to what maps you will have available at launch. 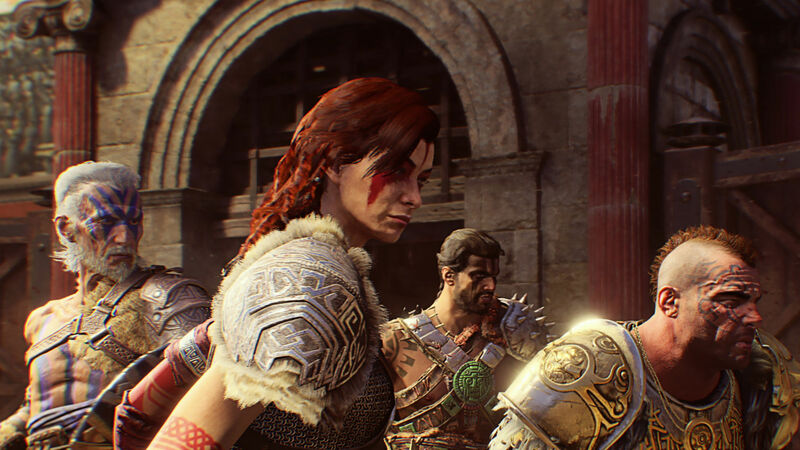 We will also continue to update this guide in the weeks after launch with fresh guides explaining everything from IX easter eggs to where you can find the shields and Pack-a-Punch machines on each map. We also have information on some of the new gameplay mechanics like Special Weapons, perk statues, and Elixirs for anybody feeling boggled by the amount of customisation options available. If you buy the standard version of the game then you will have three zombies maps ready to play right from the Call of Duty: Black Ops 4 release date: IX, Voyage of Despair, and Blood of the Dead. A fourth zombies map, Classified, will also be out when the game launches, but only for players who purchase either the Call of Duty: Black Ops 4 Season Pass or a special editions of the game. Set in Roman times, IX features a new team of heroes – the Chaos crew – travelling back in time and emerging in a coliseum where they are pitted against zombies. This map stands out as it’s set in broad daylight, but after you unlock more of the map you’ll discover a dark temple and a network of tunnels underground. You start in the middle of the map, which is the main gladiator ring. After a few rounds you should be able to unlock two of the four gates surrounding the arena, which will open up pathways both above and below the map. IX is the most open and straightforward Black Ops 4 Zombies map at launch, offering ample space for dodging packs of rotting enemies. IX also features a few minor bosses: Marauders, Gladiators, and the Blight Father. In a neat twist, you’ll also have to fight off special rounds of tigers instead of wolves. There are also a number items you can build on this map, so look out for parts to a shield and various traps as you fight to survive. The main IX easter egg has now been cracked so check out this handy guide by Zombies YouTuber MrRoflWaffles to find out how to activate and complete it for yourself. If you’re only just starting out on this map then the very first step you should focus on is unlocking the IX Pack-a-Punch machine, which we have a quick guide on. The second new Black Ops 4 zombies map featuring the new Chaos crew is Voyage of Despair. Fittingly, it’s set aboard the RMS Titanic directly after it collided with an iceberg, which means our band of misfits will need to find a way off the boat. You can watch us take on the undead hordes in the Voyage of Despair gameplay video above. So far, we have only managed to find the Voyage of Despair Pack-a-Punch machine. This map is much harder to navigate than IX and features plenty of tight corridors making it all too easy to get trapped. To help you out a little, there are teleportation portals in a few key areas around the map so if you do get overwhelmed you can always flee through one of these in exchange for a few hundred points. You’ll have to battle bosses like the Stoker and Blight Father as well, which is extremely difficult with so little space to move around in. If you’re looking for information on the Voyage of Despair main story easter egg then good news: it’s finally been cracked. 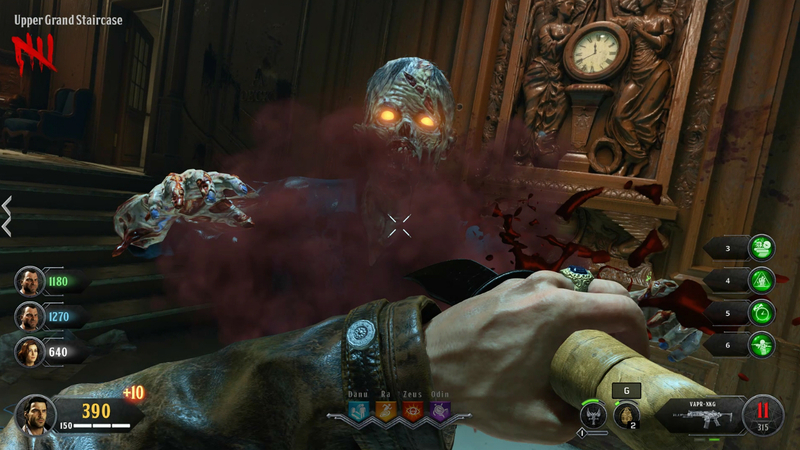 Watch this helpful, in-depth video tutorial by Zombies YouTuber MrDalekJD to find out how to complete Voyage of Despair for yourself. Blood of the Dead is a remake of the very popular Mob of the Dead Black Ops 2 map set on Alcatraz Federal Penitentiary. This map will feature the classic Primis crew who find themselves trapped in purgatory. The layout and order of rooms you unlock has been altered significantly – you can watch gameplay of it above. 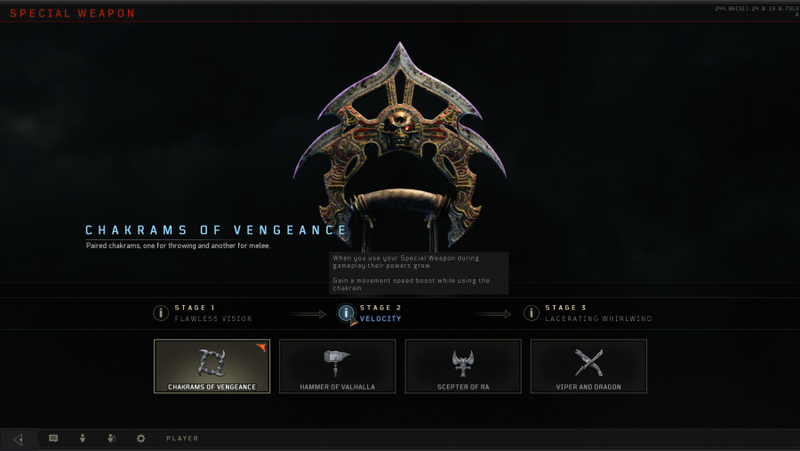 Blood of the Dead features a number of the same mechanics and weapons as the original map, such as the Blundergat and Hell’s Redeemer. 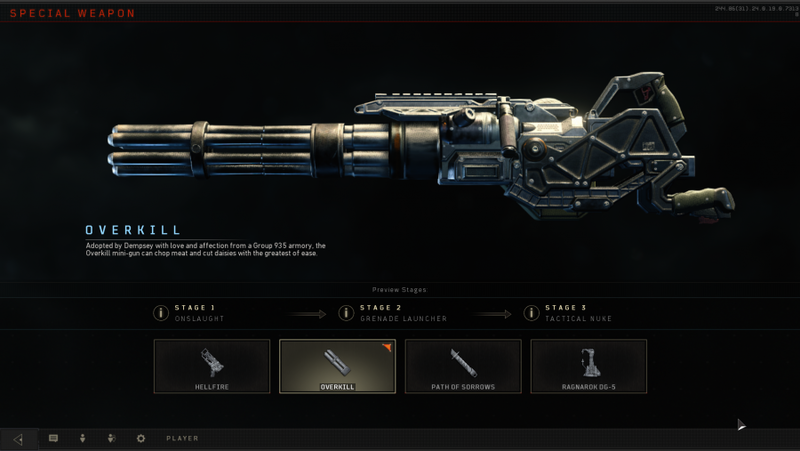 You will also have access to a bevy of special weapons via the Zombies create-a-class menu that you can rank up over the course of the match, from Takeo’s sword to Dempsey’s minigun. The main story easter egg of Blood of the Dead has been cracked, so if you want to see the next part of the Aether story then check out this complete guide by Zombies YouTuber MrDalekJD. The second remade Black Ops 4 zombies map coming to Black Ops 4 is Classified, which will see the return of the Ultimas team and the Pentagon map from the first Black Ops, Five – we also know that it is a prequel to Five and so will feature a number gameplay differences from the original. Who are the new cast of Call of Duty: Black Ops 4 zombies characters? Scarlett, Shaw, Diego, and Bruno will be the playable characters in IX and Voyage of Despair. Scarlett and Diego appear to be the rogues, male and female respectively, while Shaw is scientist of some ilk and Bruno is the team’s bruiser. None of these characteristics carry over to gameplay, so don’t go choosing Bruno thinking you’ll get a health buff as a result. You can also play both Classified and Blood of the Dead as Takeo, Dempsey, Richtofen, and Nikolai. Both sets of Zombies characters can be unlocked as character skins in Blackout, while The Shadowman can also be unlocked in battle royale, provided you have the Black Ops Pass. Treyarch want to make Black Ops 4 Zombies more replayable than their previous zombies experiences, so they have added a new way of playing zombie maps called Custom Mutations. These will allow players to change hundreds of variables covering everything from overall difficulty to zombie speed. You will then be able to save your Custom Mutations and upload them for others to play. Treyarch will be hosting their own Custom Mutations as community events, so it seems like there will be no end of challenges and events to play through post-launch. These are great fun to play with friends, but also allow you to test of different weapons and abilities without worrying about wasting points or throwing a round. Our favourite Custom Mutation involves locking every door in the map to see how long your squad can survive in the first room. For those of you looking to add a little competition to your squad’s next Zombies run, look no further than the new Rush mode. In this mode you’ll still fight to survive against increasingly challenging waves of undead, but all weapons are free, all doors unlocked, and your main aim is to accrue the most points before you all succumb to the zombie hordes. Rush features a new type of pickup that increases you score multiplier. This pickup spawns periodically along a pathway, encouraging you to explore as much of the map as possible if you want to beat your teammates score. Don’t go to gung-ho though: taking damage will decrease your multiplier. If you haven’t played a Call of Duty Zombies mode in a while then Black Ops 4’s create-a-class mode might be a little bewildering at first. You’ll find Elixirs, Perks, loadouts, Special Weapons, and much more to tweak in this class setup screen, so to help you get to grips with some of the new toys we’ve them all down for you in the guide below. Black Ops 4 Zombies Elixirs work just like Gobblegums from Black Ops 3: you can take four different types of Elixir into a match and consume each one for short-term effects. Elixirs have a cooldown time between usage, so you’ll need to use them sparingly. You have an infinite supply of green Elixirs, while the more powerful and situational types can be brewed in the Laboratory menu. These work much like Elixirs except that they grant their buffs (and are thus consumed) automatically at the start of a round. Talismans can also be made in the Laboratory but are much rarer than Elixirs. Wave goodbye to the classic Zombies perks: you won’t find Juggernog, Speed Cola, or Double Tap Root Beer in Black Ops 4 Zombies. 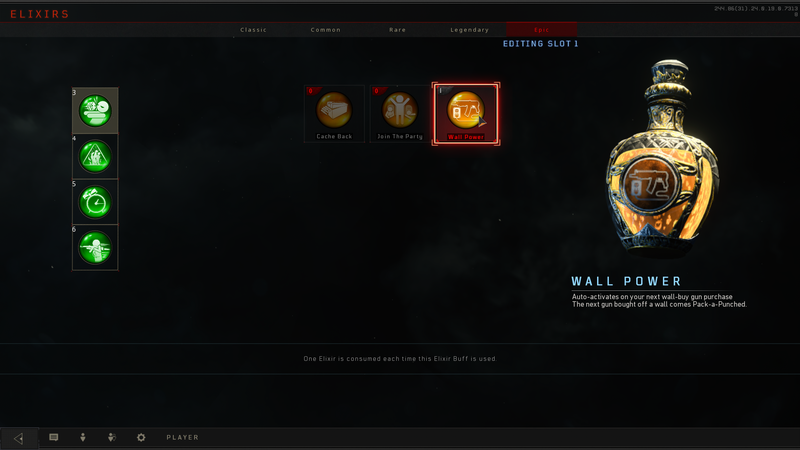 Another significant change is that you choose what four perks you want in each map via the create-a-class menu. 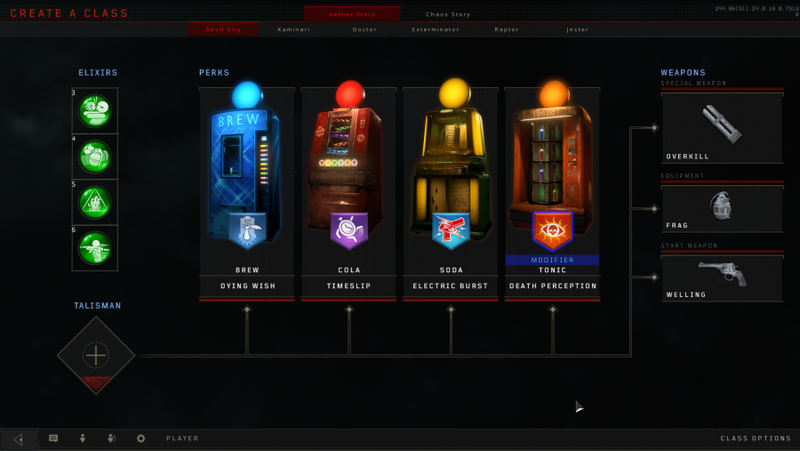 Open it up and you’ll find that there are four perk statues (Chaos story) or perk vending machines (Aether story) – these will always spawn in the same spot on each map, but before the game you can choose what perk will be available at each statue or vending machine. 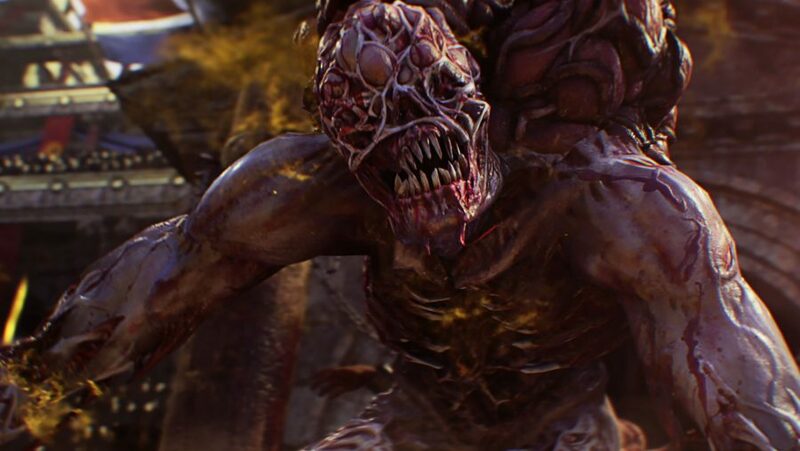 There are fourteen perks in Black ops 4 zombies, so you’ll need to choose the four you want in each match wisely. As you level up in Black Ops 4 zombies you’ll unlock new starting weapons and equipment, which will let you start the game with more than a Welling revolver. A pair of chakrams, one for melee and another for throwing. The throwable chakram will go through multiple rows of zombies before returning to you, making it highly effective at dealing with big crowds or clearing space in front you you. Send zombies flying with each swing of this melee weapon. This hammer can also stagger bosses, making it great for boss-only rounds on IX. This scepter shoots a powerful beam as its ranged attack, but can also be thrust at zombies to to disperse nearby crowds. The scepter’s beam also slows zombies as it melts them, making it possible to control huge numbers of enemies at once. This flamethrower is great for dealing a lot of damage to crowds, but it lacks the stopping power to save your hide when you’re being overwhelmed. Like the Overkill pickup from the original Black Ops, Overkill gives you a minigun that cuts through crowds with ease. This katana will slice through packs of undead up close, making it particularly useful for getting through narrow areas like the walkway on Blood of the Dead. Ground slam attacks that deal stacks of electrical damage and send zombies sprawling – this is very similar to the Hammer of Valhalla.